Pop Culture Safari! : Review: "Kirby & Lee: Stuf’ Said! 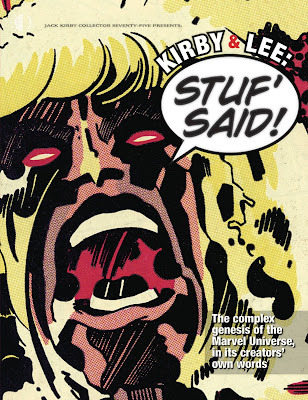 : The Complex Genesis of the Marvel Universe, in its Creators’ Own Words"
Review: "Kirby & Lee: Stuf’ Said! : The Complex Genesis of the Marvel Universe, in its Creators’ Own Words"
Ask the average moviegoer who created the Avengers, Spider-Man, Doctor Strange or the X-Men and you'll more than likely hear "Stan Lee." And that drives some comic book fans nuts. "What about Jack Kirby?!! What about Steve Ditko?!! !," they scream. The early Marvel stories were collaborative affairs and it's hard to pinpoint when the creation of a particular character took place and who all was involved. Not only did Kirby and Ditko develop the look of many of the superheroes we know and love today, they also were involved in plotting the characters' adventures and in shaping their personalities. To truly get a handle on the creation of the Marvel Universe, you'd need to re-trace the steps of the various creators and characters chronologically and look for clues as to who did what and when. And that's exactly what John Morrow has done in this new book, which includes hundreds of quotes from Lee, Kirby, Ditko and others that shed light on the creative/collaborative process involved. Over the course of the book, we come to see that, not only did these creators differ on who deserved credit for creating a particular character or writing a certain story, they differed on what terms such as "story," "script" and "plot" even mean. For Lee, coming up with a concept for a superhero was creation. For Kirby, a character wasn't fully created until he or she appeared on paper in visual form. It could also be argued to that a character isn't really defined until he or she appears in a story. And, in this book ,we see how Kirby and Ditko, and the other Marvel artists who followed, deserve much of he credit for the plots, and sub-plots, contained in many classic Marvel tales. By Lee's own admission, many comics created by these two artists followed "plot conferences" in which Lee provided very few, or no, suggestions. For example, Lee might simply tell Kirby that "Doctor Doom should be in the next issue." Kirby would then plane, pace out and draw the complete Fantastic Four story that included a battle with Doctor Doom, but also a lot of other stuff he'd come up with. And then Lee would add in finished captions and dialogue to the nearly completed result. This practice came to be called the "Marvel Method," and Lee claimed the artist-first approach in resulted in more visually exciting stories. Which is hard to argue. But is "dialoguing" the same as "writing"? It's easy to see why the artists believed they deserved more credit. On the other hand, it's hard to imagine classic Marvel stories without Lee's hyperbolic captions and engaging dialogue. Even if his contributions to a story may've been less than that made by Kirby or Ditko, his work was unique and vital. Lee did sing Kirby and Ditko's praises. We see him doing that throughout this book. Oftentimes, he essentially gives them equal credit in the creative process and in Marvel's success. But then, a page or two later, Lee will say something that again puts himself in the spotlight - it's almost as if he can't help it. His gloryhound tendencies would almost be funny if it didn't come at the expense of artists who deserved at least just much acclaim as he received, not to mention a bigger cut of Marvel's profits. Morrow has done a tremendous service to comics history here. This book is fascinating reading and should serve as a resource for anyone doing further writing about the creators it covers and the work they did. It's nice to have all these quotes and background in one place, whether its as fodder for further arguments over whether Lee gets too much credit and Kirby and Ditko not enough (or vice versa), or to more deeply appreciate, and understand, the contributions all of these guys made. One thing that, I think, can't be argued is that Marvel wouldn't have been Marvel without all three of them. You can oder "Stuf' Said!" here.